There is a lot to think about when you’re deciding on how to lay sod down. You want the grass to grow, but do you think you can handle what you need to do to make it happen? To get a healthy lawn, sod is wonderfulfor an instantly beautiful yard. Keep in mind, though, that sod can be expensive on its own or installed. You’ll also need to make sure you take a few steps to get it done correctly,so it takes root. You may be unsure if you want to go the sod route or if you’d rather go forward with seeding the ground. Before we go into how to lay sod, we’re going to discuss the pros and cons of sod. Laying sod is incredibly convenient. You can install it almost any time of year in just about any climate so long as you pick the right grass for your zone. If you keep the right grass in the right climate, then your grass will grow quite well. The perfect grass for more Southern states includes grasses like Bermuda, Zoysia, and Centipede. In cooler season climates, yourbest bet is to go with something like bluegrass, fescue, or rye grasses. Sometimes, you’ll hear stories about how sod didn’t take to the soil or maybe died, but the truth of the matter is that it isn’t the sod’s fault. Usually, it is because of the people putting the sod in due to not following proper preparations. You’ll need to be ready to lay the sod down as soon as it gets delivered to your house. Sod naturally has a very short lifespan, so you’ll want to get it on the ground as quickly as possible. As soon as it gets stacked on the pallets, it starts to dry out and decompose. Decomposition naturally has a side effect of releasing heat, so that extra heat wreaks even more havoc on the sod creating a vicious cycle. Contrary to popular belief, watering will not help and covering it with a tarp will make the entire problem worse because it actually just traps the heat. Pro Tip: Get your arm through the sod at a lower level and see if it feels hot. If it does, steer clear of that sod and get it somewhere else. Also, be sure to dress appropriately for the dirty work that you’re going to be doing. Make sure you have a pair of gloves to protect your hands and clothes you don’t mind possibly destroying. Fertilizing the soil first is essentialto make sure that it is ready for the sod once you lay it down.Starter fertilizers can be a good place to start, but if you want to go the extra mile, have your soil analyzed first. Garden centers and even some university horticultural departments will do this for free or for very low cost. Reach out to see who you can find who might be willing to help you out. Once you test your soil, you can see exactly where your soil needs extra help and pick the right fertilizer to add nutrients to your soil. You’ll also want to check on local or state regulations because,in some places, phosphorous containing fertilizer is ba​​​​​nned from being used due to potential pollution issues. When we say lower the grade, that doesn’t mean lowering the grade in school. Lowering the grade actually means taking the soil down a bit near the edge of the curb or the sidewalk. You’ll want to use a flat shovel to decrease level by about an inch or so to be able to get the grass to lay where you want it. If you don’t lower the grade enough, then your grass isn’t going to sit correctly on top of the soil. You’ll also want to consider what it would take to add a layer of topsoil. It would be a healthy addition to your soil, but it’s not required to have a healthy lawn. If you choose not to go the topsoil route, then you need to at least use a tiller to loosen up the existing soils. When you’re planning how to lay sod, you need to do it in a certain way with a specific method to the way it goes down.Always measure the yard first so you know exactly how much sod you’ll need. Start by placing the sod all along the edge, kind of like a jigsaw puzzle. You want to frame the sod by putting down what is called a header row all along the perimeter and along the house. The resulting effect will be edges that aren’t quite so obvious. As you fill in space in the center, make sure you pull the sod tight next to each piece. Don’t overlap because if you do, the edges are going to dry out really quickly. You want to minimize the gaps because you don’t want the edges exposed. They will also dry out if exposed due to a largegap between sod pieces. Pro Tip: If your sod arrives in rolls, lay it out as quickly as possible,so it does not curl and refuse to lay flat. You will have to cut the sod every so often to adjust the size that you’re filling. As a rule of thumb, always cut the sod from the underside, or the dark side, because it is easier to cut from that direction. By cutting from the bottom, you’ll always be able to see what you’re doing,and the only tool you need for the job is a simple utility knife. Pro Tip: When using a utility knife, make sure it will stand out from the sod. A bright color is best,so you don’t end up accidentally burying your knife. As you lay the sod, stagger the seams. If you don’t, you’re going to end up with some really obvious long seams that won’t look good in your yard. Yes, it will eventually get covered, but while you’re waiting, it’s going to be an eyesore. When you start to lay it down, if it is in long strips, lay the sod perpendicular to the road. It will look fuller that way to anyone who drives by. The seams will also not be as obvious. 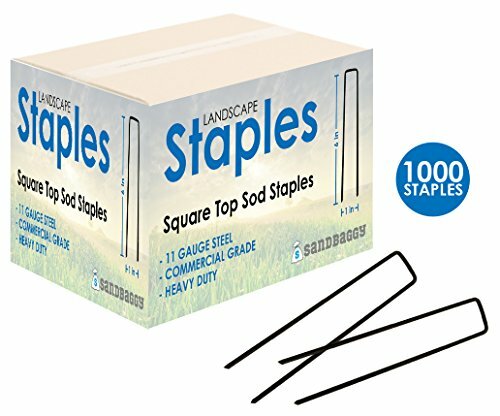 If you need to put sod on a hill, don’t forget to have stakes to keep it in place. You can get inexpensive wooden stakes at stores like Home Depot or Lowe’s. Alternatively, there are also biodegradable options for stakes as well. Either way, don’t forget about them because as soon as it rains if those sod pieces aren’t held in place, you’re going to see them wash away with the rain. Pro Tip: Remember, on a hill, start at the bottom and work your way up to get the best coverage. When going around a gradual curve, a single piece of sod can be used. If the curve is deeper, then you’ll need to cut pie-shaped wedges out of it to get it to lay properly. When you’re done with the sod, you’re going to have plenty of leftover smaller pieces that you needed to trim from various pieces. Don’t throw them away. Instead, lay them wherever you might have a small gap. Just make sure you water it all and the sod will thrive. It’s a good idea to use an industrial roller to force the sod down on the soil. This makes the roots reach the soil faster and give the sod a faster settling process. If you don’t want to use a roller, rest assured that the sod will eventually settle into place, but it will take longer. Lastly, don’t forget to water the sod regularly at least 2-3 times per day for the first couple weeks, and then once a day in the third week. To keep it growing, make sure you water it at least once every other morning. Follow these instructions about how to lay sod down on your yard,and you’ll have a beautiful yard quick as a whip.